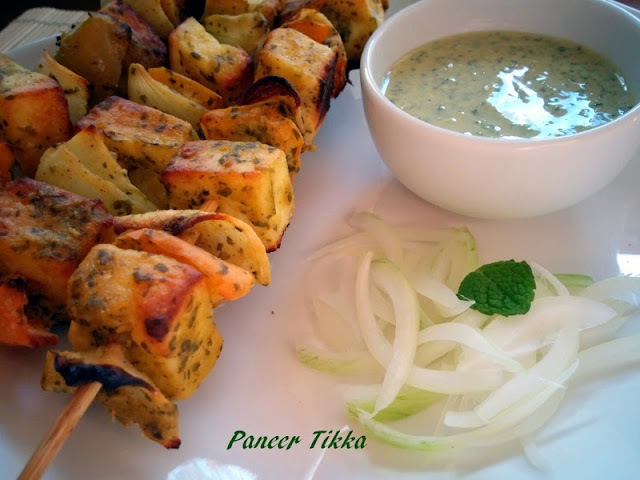 Paneer Tikka is one of the most popular starters ordered in a restaurant. This is also one of the most famous Indian Vegetarian Barbecue dish. Paneer Tikka is a dish made from chunks of paneer, onions, colorful capsicum and tomatoes. All these veggies are marinated, thread on a skewer and cooked on a tandoor. 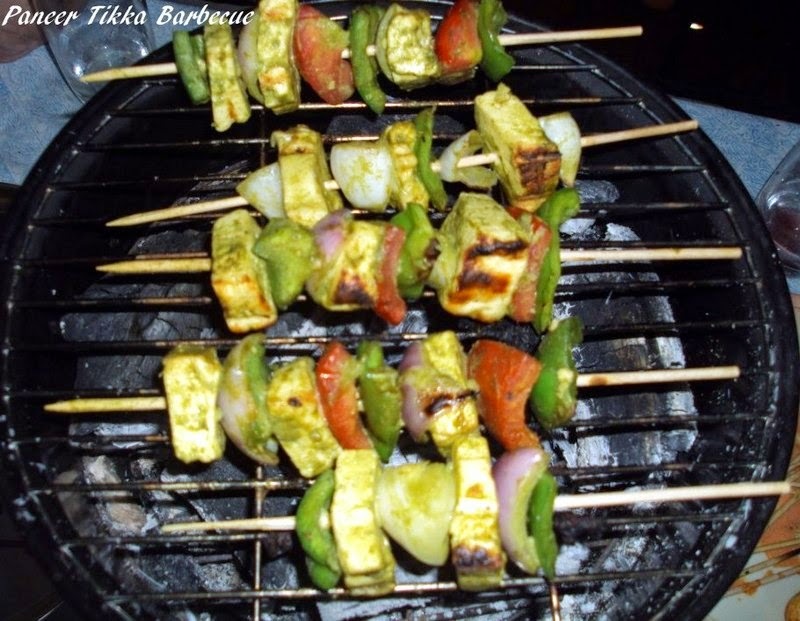 All the veggies when cooked on a tandoor gives a nice smoky flavor. However as we don't have tandoor at home , we can either make them in a oven, barbecue or tawa. 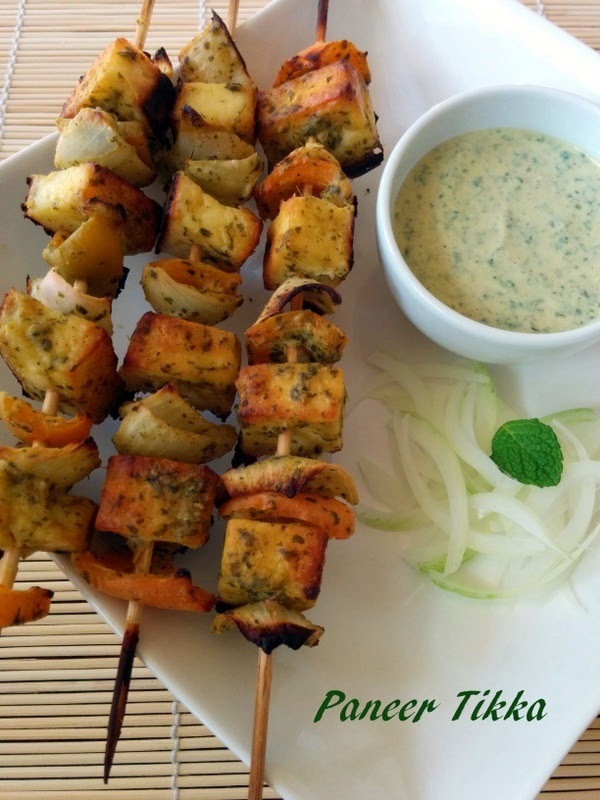 Tawa is always a good and quick option to make Paneer Tikka at home. The texture will be same but the smoky effect will be missing. To get that smoky effect you can either cook in a oven or barbecue. 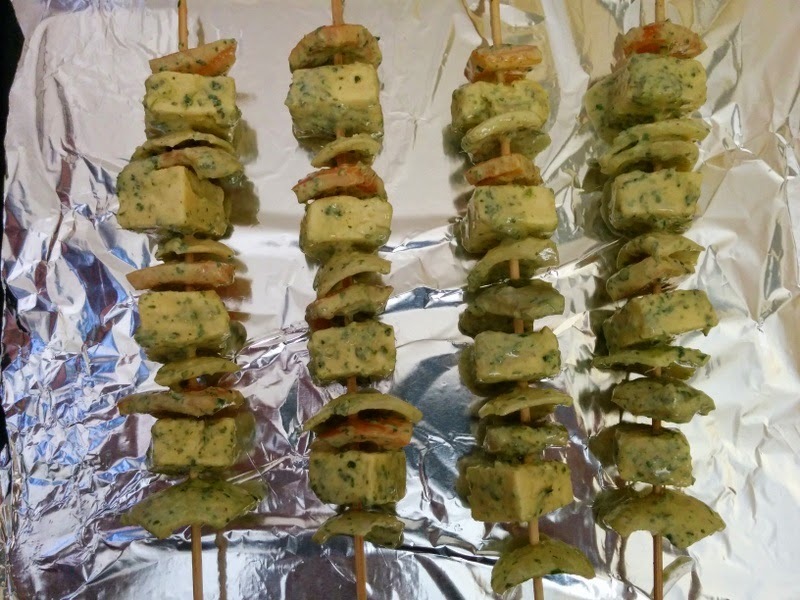 This is a dry version of paneer tikka. You can even enjoy the gravy version also known as paneer tikka masala. Paneer tikka masala is served with naan or parathas. Now a days you can even make Paneer Tikka Pizza or Paneer Tikka Bruschetta. So you can make a lot of fusion food with this dry dish. Paneer Tikka is served hot with fresh mint & coriander chutney and onion salad. To make paneer tikka we need hung curd. Take 1.5 cups curd and hand it on a muslin cloth for minimum of 30-40 minutes. 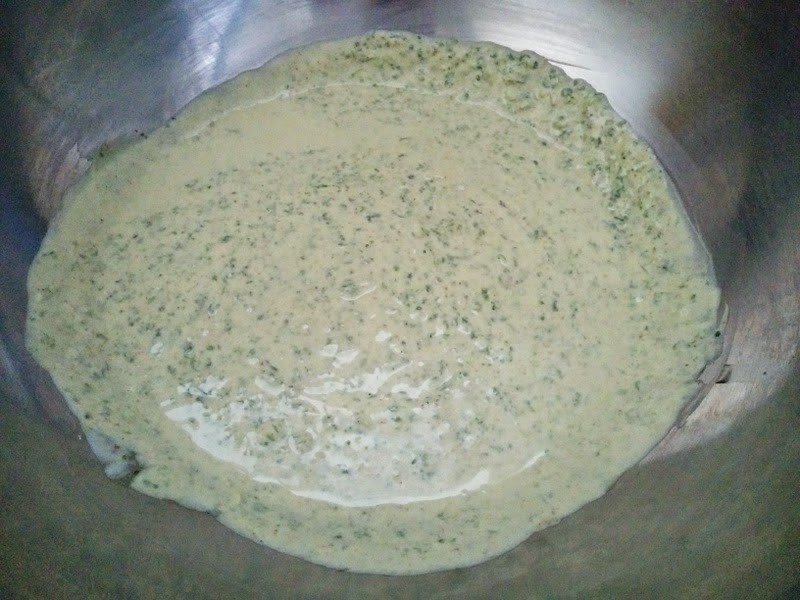 If the curd is still watery hang it for 30 minutes more. 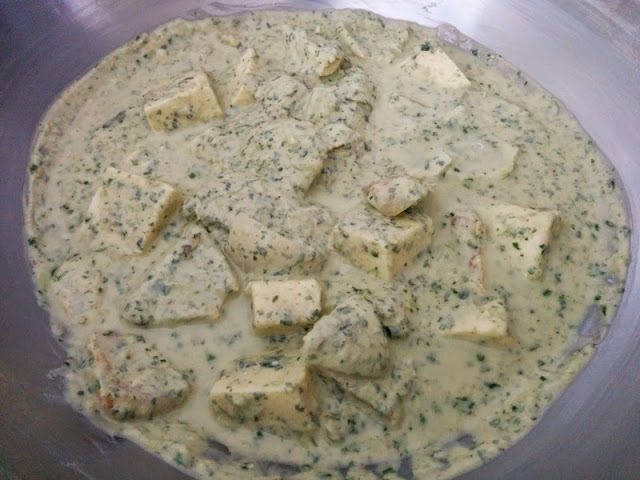 To get the best results for hung curd i always prefer to hang it overnight just like we do it while making shrikhand. 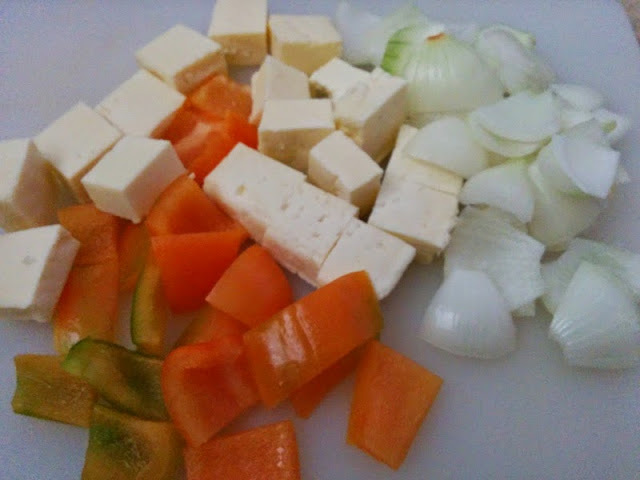 Cut paneer, onion and capsicum into cubes. 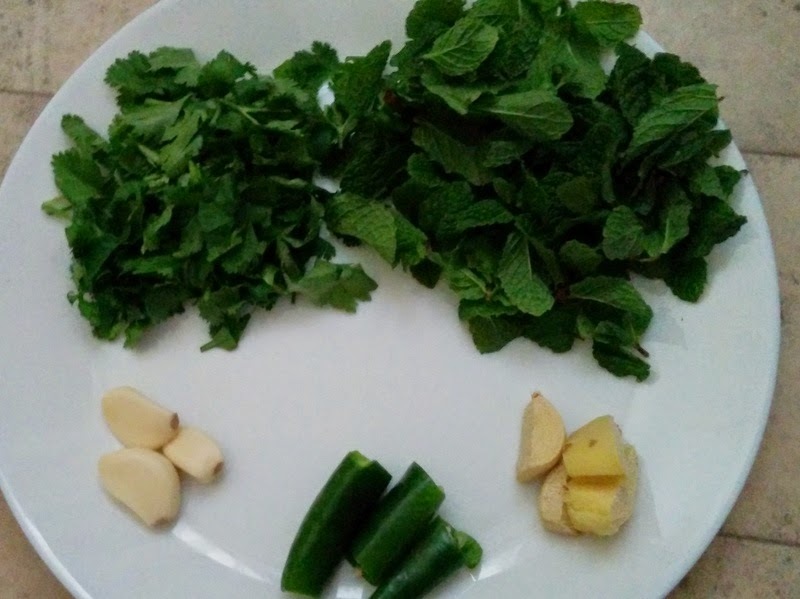 Wash and chop some fresh coriander leaves, mint leaves and green chilies. Also chop some peeled ginger and garlic. 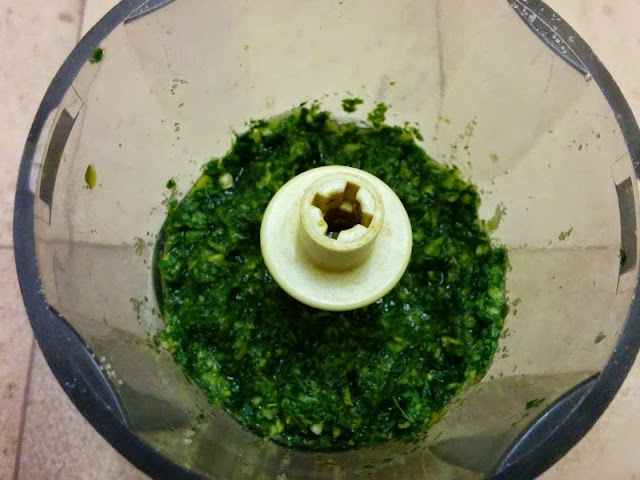 In a grinder add all the above ingredients little salt and grind it to a fine paste. As soon as the paste is ready, add some lemon juice else the paste will turn black in color. 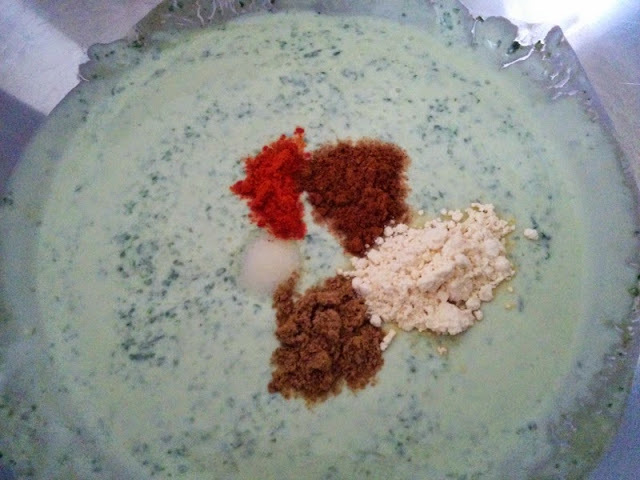 Now take hung curd and add the paste we prepared. Also add red chilli powder, salt, gram flour, coriander powder,cooking oil, lemon juice and garam masala. Mix all the ingredients well and our marinate is ready. 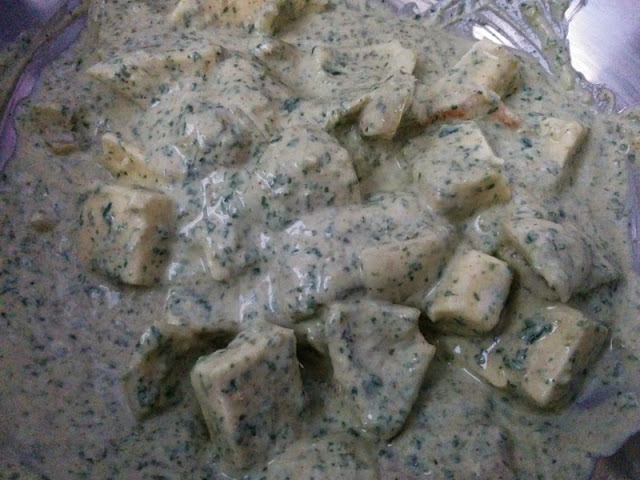 Add the paneer and veggie chunks to the marinade. Mix gently and coat all the veggies. All the veggies should be well coated with the marinade. 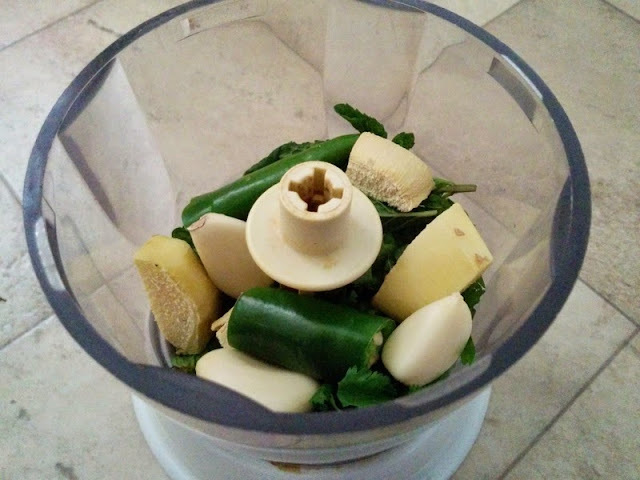 Keep the marinated veggies in refrigerator for minimum of 1 hour. The marinated veggies are now ready to be baked or tandoored. Arrange the marinated veggies on skewers or toothpick. To make sure we do not repeat the same veggies i have made a sequence. First onion slice, then paneer and then capsicum. Repeat this sequence till all veggies are used. 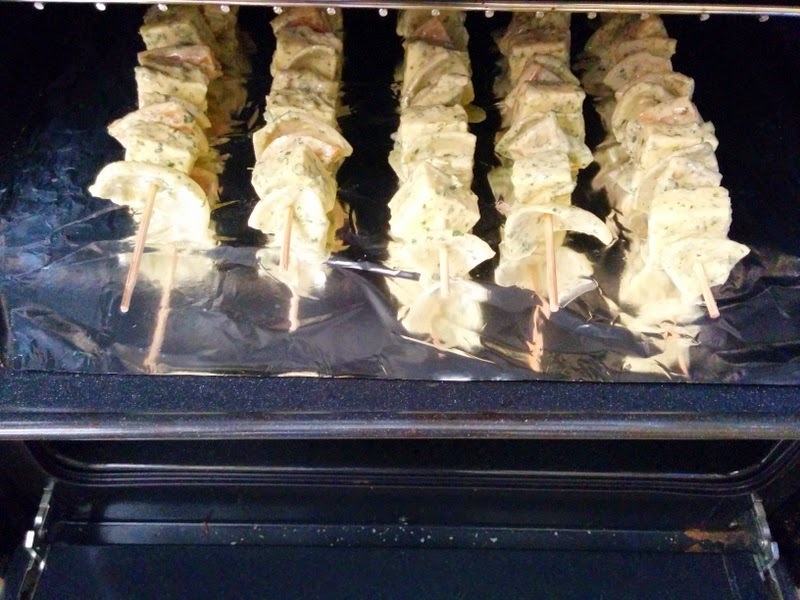 Place the oven tray in preheated oven and bake at 220 degrees till the veggies are golden brown in color. It will take around 20 minutes. 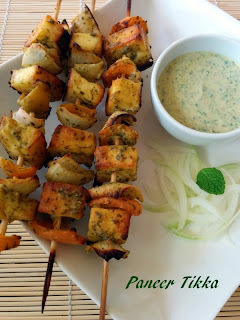 Paneer Tikka is ready serve hot with mint & coriander chutney and onion salad. 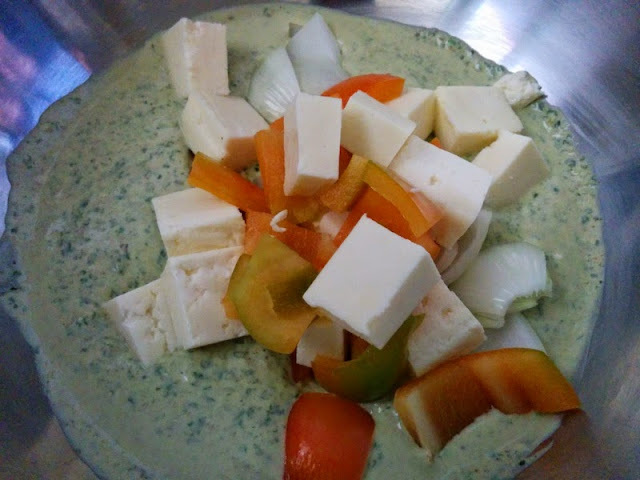 Cut some fresh paneer, capsicums and onions in square cubes.Add the paneer and veggie chunks to the marinade. This is the picture of hara bhara paneer tikka i had prepared for my friends during a barbecue party.